Centerville’s Sydney White (8) and Kara Allen (14) double team Beavercreek scoring leader Marcella Cash (23), in the first half of an Oct. 10 girls high school soccer match at Legacy Stadium in Centerville. Cash assisted on two of the Beaver’s three goals in the 3-0 Beavercreek win. 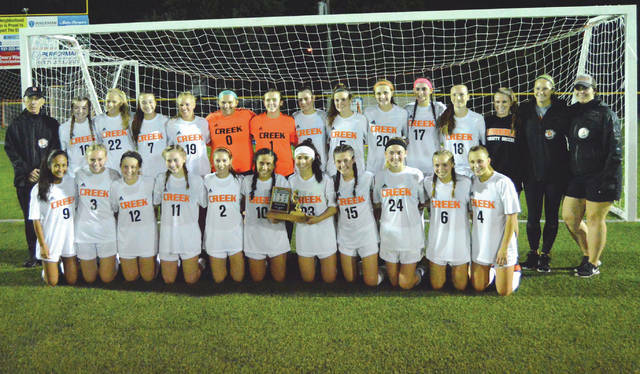 Marcella Cash (23) and Diana Benigno (10) hold the divisional championship trophy during a team photo after Wednesday’s 3-0 shutout win over host Centerville at Legacy Stadium. 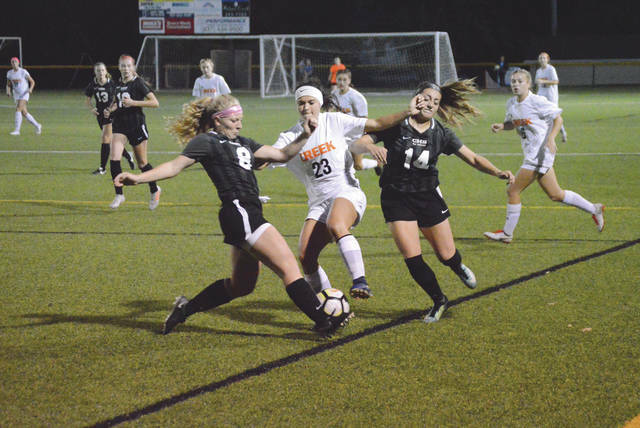 CENTERVILLE — Not even a bus — or the lack of one — could stop the Beavercreek girls soccer team. The visiting Beavers blanked the Centerville Elks, 3-0, to claim the Greater Western Ohio Conference, National East division title. As late as 5:30 p.m., less than two hours before Wednesday’s crucial battle on Centerville’s Legacy Field, the Beavers were without a mode of transportation to get them there. Some quick phone work by ‘Creek Athletic Director Brad Pompos fixed the situation. “We’ve played in rain, we’ve played in heat. We didn’t have a bus tonight … with all the distractions we’ve had at times this season, we’ve still finished with a good result,” Beavercreek coach Steve Popp said. Once the Beavers set foot on Centerville’s turf, the team did the rest. Centerville (12-2-2, 6-2 GWOC East) knew all about Beavercreek’s Marcella Cash and Diana Benigno, who entered the contest ranked second and fifth respectively on the GWOC scoring charts. And so the Elks spent a good portion of the game double- and sometimes even triple-teaming the two talented players. With a pair of Elks on her back roughly 13 minutes into the match, Cash drove deep into the right side of the Centerville field then crossed a pass to teammate Jenna McCartney who bashed a shot into the right side of the nets for the first Beavercreek goal. Cash then juked and jived her way around a pair of Centerville defenders on the left side with 21:59 left in the first half, before dishing a soft pass over to Benigno, who then buried the kick past the Elks goalie for a 2-0 lead. The Beavers’ third goal ended up being Benigno’s second of the night. With just under 18 minutes left in the match, the Beavers ‘got through’ for one final time. Beavercreek’s Kaileigh Nuessgen was able to drive deep into the right side of the Elks half of the pitch. Nuessgen then fired a crossing pass left to Molly Sedlock, who then slipped a pass over to Benigno for a chip-in score from the left side. “This is a very difficult place to win, here in Centerville. It’s one of the great soccer stadiums where it’s hard for visiting teams to win on. I did think there were times actually where Centerville had a good rhythm going, where they were controlling the ball. I think we might’ve gotten a bit flat in parts of the game, but we were able to make some big plays to get some of those early key goals, and that gave us a little bit of separation, which helped,” Popp said. According to the Centerville pressbox officials, the Elks managed just one shot (an Alexis Hutchison attempt that sailed wide right with nine minutes left to play) for the entire game. In a bit of sportsmanship, Beavercreek’s Popp and Pompos took great care in making sure that the team’s victory photo with the Division trophy didn’t have a Centerville Elks logo in the frame. No sense in stirring up an already heated rivalry even more. It’s been 34 days since a goal has been scored on Beavercreek (16-0-0, 8-0-0 GWOC East). They’ve now recorded 11 shutouts in a row. They have now outscored their opponents by a 97-3 margin. The Beavers will now focus on their first-round postseason contest, which is set for 7 p.m., Tuesday, Oct. 16 at home against Springfield, a team that is part of the current shutout streak. Beavercreek defeated Springfield by a score of 9-0 back on Sept. 19.